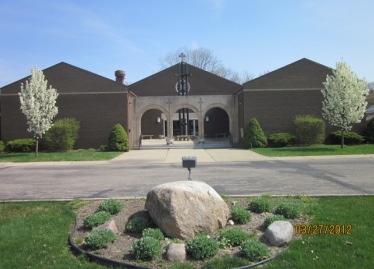 St Paul Cathedral in Dearborn Heights is located west of Detroit and Dearborn, south of Redford and Livonia, east of Westland and north of Allen Park and Taylor. Take the Beech Daly exit and go south for 5 miles. The Cathedral is on the east side of Beech Daly Rd (#700) between SS Peter and Paul Romanian Orthodox Church and Our Savior Polish National Catholic Church. Take the Telegraph exit. Go north for about 10 miles to the intersection of Cherry Hill. Go west on Cherry Hill for 1 mile to the intersection of Beech Daly Rd. Go north on Beech Daly Rd for about 1/4 mile. The Cathedral is on the east side of Beech Daly Rd (#700) between SS Peter and Paul Romanian Orthodox Church and Our Savior Polish National Catholic Church. 6:30 PM Vespers and Confession. 6:30 PM Vespers and Presanctified Liturgy. Originally, the parish consisted of Macedonian and Bulgarian immigrants in between the World Wars. Now there are second, third, and fourth generation Macedonian and Bulgarian families as well as other Slavs, Russians, Ukrainians, Greeks, Ethiopians, Arabs, and converts.